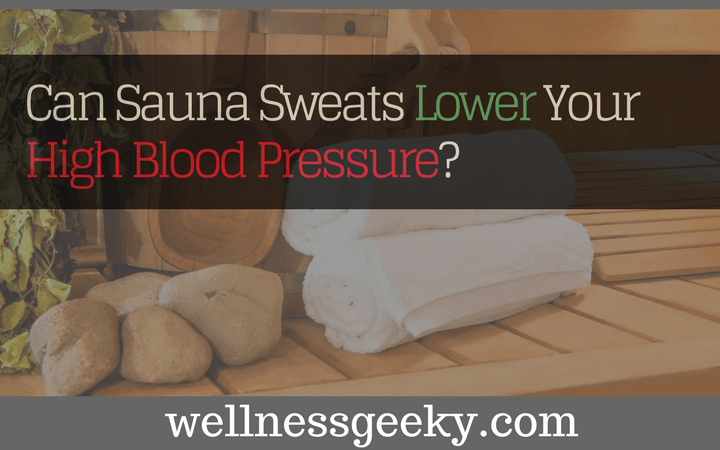 Can Sauna Sweats Lower Your High Blood Pressure? You are here: Home / Home Wellness / Saunas / Can Sauna Sweats Lower Your High Blood Pressure? Blood pressure is the amount of force of blood pushing against the walls of your arteries. It may become higher than average if you don’t control it. High blood pressure, or hypertension, can provide numerous health problems. Some of them are preventing heart stroke, vision problems, heart failure and kidney disease. If an individual suffers from high blood pressure, that means that the walls of the arteries are continually receiving an excessive amount of pressure. One of the risk factors may be age. As you get older, you are more prone to have higher blood pressure compare to when you are younger. Another factor may be your genes. If someone in your family history suffers from hypertension, then the chances of you having it are higher. The research published by the American Medical Association shows the relationship between blood pressure and outdoor temperature. Therefore, if it’s warm outside, then it's lowers blood pressure, same as sauna sweats lower your blood pressure and vice versa. In addition to that, obese people are more prone to develop hypertension in comparison to people of average weight. Lack of physical activity and a sedentary lifestyle can raise the risk of high blood pressure. Combines with smoking and drinking than the heart will pump blood even faster. Mental stress and too salty or fatty foods can play a significant role in developing hypertension. Despite these risk factors, there are several ways to prevent it. One of the most beneficial ones may be a sauna. What Benefits Does Sauna Offer? First and foremost, sauna provides us a thick sweat. It yields tension relief, helps with muscle soreness, and it can relax your mind. A persistent heat can make our bodies to function and look better. One of the most significant advantages is stress relief. Sauna provides an isolated, warm and quiet place. You won’t have any distractions. The heat will help you to relax both mind and body. It can improve blood flow and relax muscles. After you complete your session, endorphin level will be higher, and stress level will be lower. When you sit at a high temperature, your body’s temperature will rise. This fact can cause your blood vessels to dilate and the healing process to speed up. If you play sports, this method can help you with muscle soreness and tension. Additionally, bruises and cuts will heal faster. By using the good infrared sauna, your body will produce sweat that can help you with reducing levels of toxins. It will detoxify your body, improve blood flow circulation and lower your blood pressure. Furthermore, a broad sweat caused by high temperature can provide you better skin. When the body starts sweating, dead skin cells are beginning to replace themselves creating a healthier looking skin. The capillary circulation will be improved by cleansing the pores and rinsing bacteria out. Since sauna is a quiet and intimate room, it’s a suitable place for relaxation and private conversation. Thus, you can bring a friend with you to catch up. By using sauna regularly, we can improve the function of heart muscles, along with the regulatory system. Additionally, it can prevent cold or influenza. Your body will produce white blood cells faster when exposed to the steam and heat. That way, your body can fight viruses and illnesses. One more benefit is the relief of symptoms of sinus congestion caused by colds or allergies. A sauna can help people with asthma problems by opening airways, losing phlegm and reducing anxiety. Researchers from Finland published their study that linked reduced dementia or Alzheimer’s disease and sauna use. Individuals who used saunabath on a daily basis had a lower risk of developing these diseases. Sauna bath may help individuals with risk factors for diabetes and high cholesterol. People who overdo the sauna use or have particular health condition may experience several adverse effects. Before even starting, you should consult with a medical expert. Due to excessive sweating, you might experience dehydration. People with kidney disease are at a higher risk. Higher temperatures can yield nausea and dizziness. You might experience burns if you touch the heater. Not recommended for people who are trying to conceive a child. Fungal infections can spread quickly. Don’t spend more than Twenty minutes inside the sauna. Drink water immediately after the session. If you’re ill, you should avoid sauna. Far infrared sauna – individual lamps use light waves to heat only the person’s body, not the entire room. Temperatures are lower in infrared saunas, but the person sweats the same. The study published in the American Journal of Hypertension shows that people who use sauna on a daily basis can lower the risk of developing hypertension and cardiovascular disease. During your stay in the sauna, your body’s temperature rises, and your blood vessels widen. If you repeat this process continuously, you can improve the function of your vessels. Also, the sauna can remove excess fluid from your body throughout sweat. However, this effect depends on a routine. People who used sauna 4-7 times per week had the lower risk of hypertension in comparison to those who used only once a week. Since high blood pressure is a significant factor in developing heart disease, you will have the following benefit: the reduction of the risk of death caused by heart disease. If you combine sauna with the right diet, hot baths, and proper exercise regime, you can have even more advantages. However, if you switch from high temperature in the sauna to cold water from a swimming pool or jacuzzi, you might do just the opposite and raise blood pressure. By using the sauna, you will prevent damage to your kidneys, eyes, heart, and arteries. Can you go in a sauna with high blood pressure? - If you already have hypertension, by using sauna you may worsen your condition. You can experience a temporary lowering of pressure. However, the moment you leave sauna, it can either return to normal or become even higher. Thus, you should consult with your doctor before using the sauna. Does sweating reduce salt levels in the body?- The amount of sodium in your sweat is around 500mg/lb. Therefore, if you lose 2lbs of sweat per hour, your sodium loss become huge. You should eat foods loaded with salt to replace the loss. Because of the excessive sweat, it’s crucial to drink several glasses of water after the session ends. Recommended duration of sauna use is 20 minutes. Sweating in saunas is often used as a therapy. People use saunas for centuries due to its numerous benefits for mind and body. In this case, it’s proven to be suitable therapy method for patients who suffer from hypertension. Additionally, sauna yields cardiovascular and overall health. Furthermore, it reinvigorates those who are worn out from a workout or long day at work, and it helps you to relax and unwind.